The 2016 San Francisco 49ers season is the San Francisco 49ers franchise's 67th season in the National Football League, the 71st overall, the third playing its home games at Levi's Stadium and the first under new head coach Chip Kelly. After the season ended, the 49ers fired Jim Tomsula as head coach. On January 14, 2016, the 49ers hired Kelly as their head coach. Kelly had spent the previous three seasons as head coach for the Philadelphia Eagles and was fired after a disappointing 7-9 Eagles season. – Light green background indicates a player has been re-signed by the 49ers. – Light red background indicates a player has departed the 49ers. ^[a] The 49ers traded their second-, fourth- and sixth-round selection (Nos. 37, 105 and 178 overall) to the Kansas City Chiefs in exchange for their first- and seventh-round selection (Nos. 28 and 249 overall). ^[b] The 49ers acquired an additional fifth-round selection as part of a trade that sent their 2015 first-round selection to the San Diego Chargers. ^[c] The 49ers acquired a sixth-round selection in a trade that sent their 2015 seventh-round selection to the Dallas Cowboys. ^[d] The 49ers traded tight end Vernon Davis and their 2016 seventh-round selection to the Denver Broncos in exchange for the Broncos' 2016 sixth-round and 2017 sixth-round selections. The 49ers' preseason opponents and schedule were announced April 7, 2016. 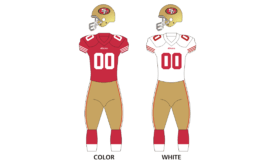 The 49ers wore their black alternate uniforms for this game as part of Color Rush. Days prior to Week 6, it was confirmed by Chip Kelly that Colin Kaepernick will start in place of Blaine Gabbert. This was Kaepernick's first start of the season. With the loss, the 49ers were mathematically eliminated from postseason contention for the 3rd consecutive season. An attempted rally by the 49ers was stopped short of the end zone in the final seconds. ↑ "San Francisco 49ers fire coach Jim Tomsula". NFL.com. Retrieved 3 January 2016. ↑ Patra, Kevin (January 14, 2016). "San Francisco 49ers hire Chip Kelly as head coach". NFL.com. Retrieved January 14, 2016. ↑ "49ers UFA". Spotrac. January 14, 2016. Retrieved January 14, 2016. ↑ "Vikings Sign G Alex Boone". vikings.com. March 10, 2016. Retrieved March 10, 2016. ↑ Patra, Kevin. "Niners sign TE Garrett Celek to four-year extension". NFL.com. Retrieved 24 February 2016. ↑ "49ers Re-sign NT Ian Williams to One-year Deal". NFL.com. Retrieved 23 March 2016. 1 2 "49ers Tender One-year Contracts to LB Michael Wilhoite and OL Jordan Devey". 49ers.com. Retrieved 9 March 2016. ↑ "49ers OL Jordan Devey Signs One-year Tender". 49ers.com. Retrieved 5 April 2016. ↑ "49ers Re-sign LB Michael Wilhoite to One-year Deal". 49ers.com. Retrieved 4 May 2016. ↑ "49ers Re-sign K Phil Dawson to One-year Contract". 49ers.com. Retrieved 15 March 2016. ↑ "49ers Sign LB Ray-Ray Armstrong to Extension". 49ers.com. Retrieved 9 March 2016. ↑ Dragon, Tyler. "Shaun Draughn signs one-year deal with 49ers". NFL.com. Retrieved 2 March 2016. ↑ "49ers Re-sign DT Tony Jerod-Eddie". 49ers.com. Retrieved 5 April 2016. ↑ Bergman, Jeremy. "Niners signing CFL star receiver Eric Rogers". NFL.com. Retrieved 25 February 2016. ↑ "49ers Sign QB Thad Lewis to One-year Deal". 49ers.com. Retrieved 11 March 2016. ↑ "49ers Sign G Zane Beadles to Three-year Contract". 49ers.com. Retrieved 23 March 2016. 1 2 "49ers Sign WR Ryan Whalen, Waived/Injured S Jered Bell". 49ers.com. August 23, 2016. Retrieved August 24, 2016. ↑ "Jarryd Hayne Announces Retirement from the NFL". 49ers.com. Retrieved May 15, 2016. ↑ Patra, Kevin. "Niners' Jarryd Hayne retires to pursue Olympic dream". NFL.com. Retrieved May 16, 2016. ↑ Price, Taylor. "San Francisco 49ers Draft Stanford G Joshua Garnett". 49ers.com. Retrieved April 29, 2016. ↑ Sessler, Marc. "San Diego Chargers trade up for RB Melvin Gordon". NFL.com. Retrieved 1 May 2015. 1 2 3 4 "49ers Announce Several Roster Moves". 49ers.com. Retrieved August 28, 2016. 1 2 3 4 5 "49ers Release 20 Players, Announce Other Roster Moves". 49ers.com. Retrieved September 3, 2016. 1 2 "San Francisco 49ers Sign LB Wynton McManis, Waive LB Kevin Anderson". 49ers.com. Retrieved May 12, 2016. Wikimedia Commons has media related to 2016 San Francisco 49ers season.